Double Tap is the perfect semi-mechanical keyboard and optical mouse set for those whose battles never stop. This gaming kit will make your victories taste sweeter thanks to the rapport between the two devices and the speed and precision that they offer you in every game. Both of these accessories have been conceived to provide the highest level of comfort during long gaming sessions. 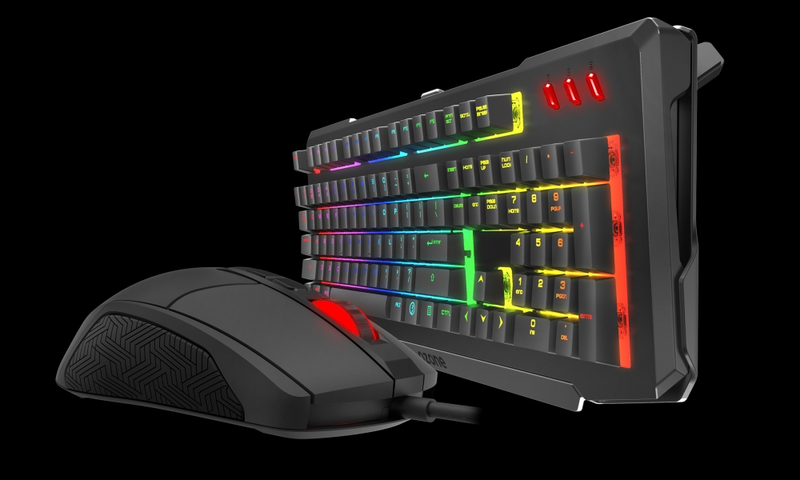 In addition the keyboard features RGB technology that you’ll be able to personalize directly, and choose between several illumination effects that mean you’ll enjoy every single game both day and night, without losing sight of your weapons of war. From the merging of mechanical and membrane keyboards comes this hybrid keyboard: a format that’s increasingly popular in the gaming scene and that unifies the robustness and agility of both types. Its anti-splash design is designed to allow you to stay relaxed during the game without worrying about spills and splashes from nearby drinks. The Double Tap keyboard features semi-mechanical CrossTech Switches that guarantee optimal response time as well as the touch and durability associated with mechanical keyboards. In addition, it comes with 26 anti-ghosting keys and a gaming mode key (disables the Windows key), so that nothing interferes with your concentration during a game. The Double Tap mouse adapts to any kind of player thanks to its symmetrical and ambidextrous design fitted with texturized side grips that offer maximum grip and comfort, and which is perfectly adapted to both left-handed and right-handed users. It features an Avago A3050 optical sensor and a resolution of up to 4000 DPI in 6 levels: 750, 1250, 1750, 2500, 3000 and 4000, which are backlit in red, blue, green, yellow, cyan and magenta respectively. Its braided cable guarantees high durability over time and the gold-plated USB connection an optimal connection. 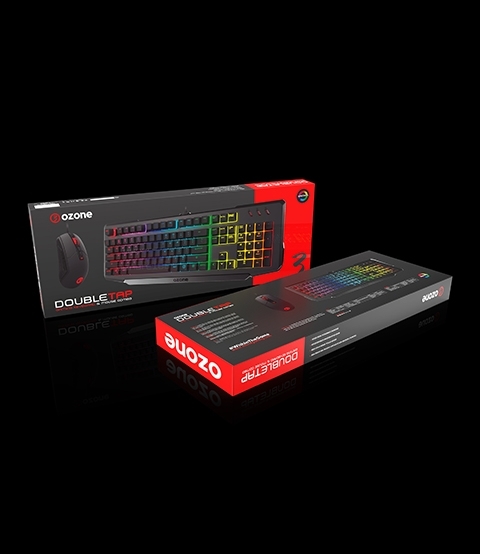 Ozone Double Tap es un buen kit de teclado y ratón, con aspecto gaming, para nuestro ordenador. El combo de teclado y ratón de Ozone Double Tap es un buen conjunto para nuestras partidas online. Ozone Double Tap es un combo de teclado y ratón que nos ofrece unas muy buenas características por un precio ajustado.